Our kitchen has ended up a little out of the ordinary. Starting from a clear focus on low chemical use and simple materials, we’ve made a few decisions that might be interesting. We’ve completely avoided using melamine-covered particleboard (“whiteboard“), as this emits huge amounts of volatile organic chemicals (VOCs), is considered industrial waste when the kitchen is taken apart, and can’t be recycled. This is truly nasty stuff. Instead, we used an E0 FSC-certified birch eco-ply from Finland (of all places!). “E0” indicates the lowest level of VOC emissions, and this ply has every certification going. It’s also a truly beautiful material. The inside of the cupboards are protected with shellac, a lot friendlier than many of the artificial sealants. The benchtops are unsealed solid kauri, with experience in other kitchens showing that while they wear and mark over time, ongoing gentle cleaning keeps them looking beautiful. The cupboard fronts are solid kauri, painted with low-VOC Haymes paints (no two-pac polyurethane coatings here!). In addition to being much better for the environment, the semi-gloss paint gives a much softer and warmer feel to the kitchen. The walls and ceilings are also painted with low-VOC Haymes paints. The floors are solid kauri floorboards, with a tung oil finish (no polyurethane finishes again). LED lights are used throughout, including the downlights in the ceiling and the strip lighting under the upper cupboards. The large servery window (which can be opened onto the deck) and the upper window behind the cooktop both bring in lots of natural light, reducing the need for artificial lighting. The moving glass is double-glazed, while the fixed glass is triple glazed. The fridge (brought from our old house) was purchased as the only 5-star efficient fridge at the time, slashing our electricity bills. There is an under-floor vent beneath the fridge to draw in cool air (increasing efficiency by up to 20%), with a wall vent that goes into the pantry cool cupboard (more on this in a future post). We chose a water and energy efficient Miele dishwasher, installed new as part of the fitout. We have an on-bench compost bin, collecting scraps for the big compost bins and worm farms outside. There is also a recycling bin inside one of the cupboards. There’s a walk-in pantry beside the kitchen, which is cool and dark (also to be covered in a future post). We love the kitchen, and it’s both practical and beautiful (we think). As it turned out, commercial kitchen companies couldn’t cope at all with our requirements. So we had it made by a local craftsman, Ian Thomson (see his website for more on this work). While it isn’t a cheap option by any means, we’d highly recommend going down the route of a bespoke kitchen, as it gives the time and opportunity to really refine what will be delivered. 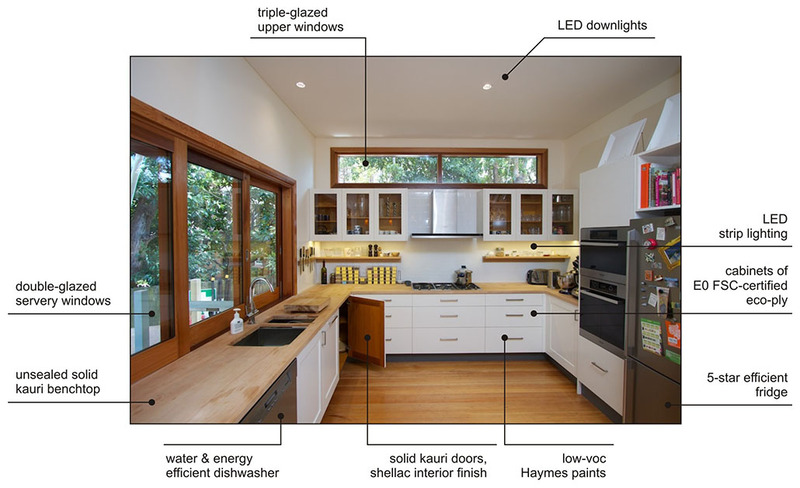 This entry was posted in Renovating the house and tagged compost bins, dishwasher, eco-ply, fridge, kauri, kitchen, LED lights, low VOC, pantry, shellac, strip lighting, tung oil, VOC, volatile organic chemicals. I see you kitchen guy has French traditions!